10 Copyright © 2008, Intel Corporation. All rights reserved. Intel, the Intel logo, Intel Education Initiative, and Intel Teach Program are trademarks of Intel Corporation in the U.S. and other countries. *Other names and brands may be claimed as the property of others. 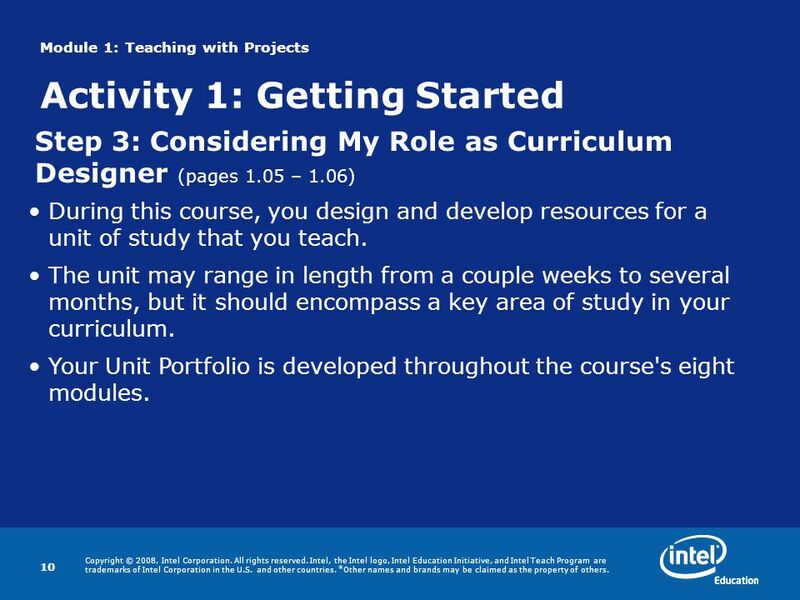 10 Step 3: Considering My Role as Curriculum Designer (pages 1.05 – 1.06) Module 1: Teaching with Projects Activity 1: Getting Started During this course, you design and develop resources for a unit of study that you teach. 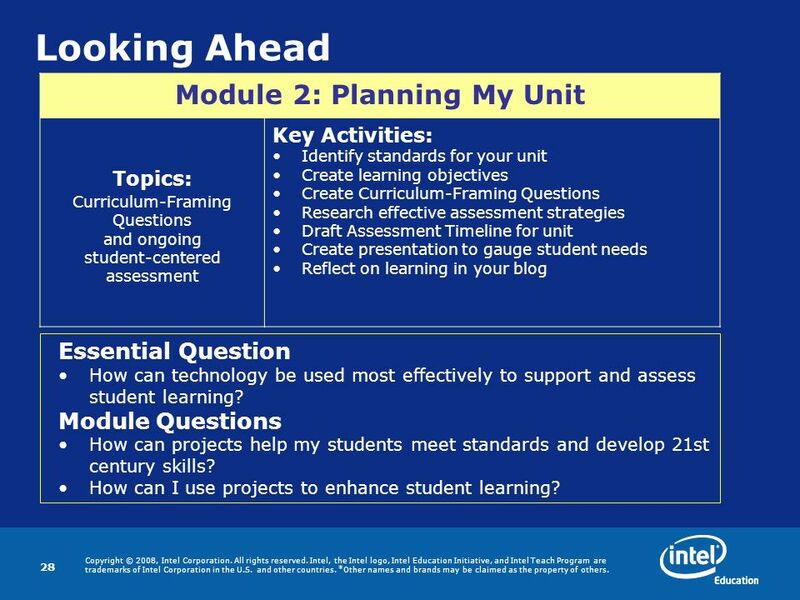 The unit may range in length from a couple weeks to several months, but it should encompass a key area of study in your curriculum. 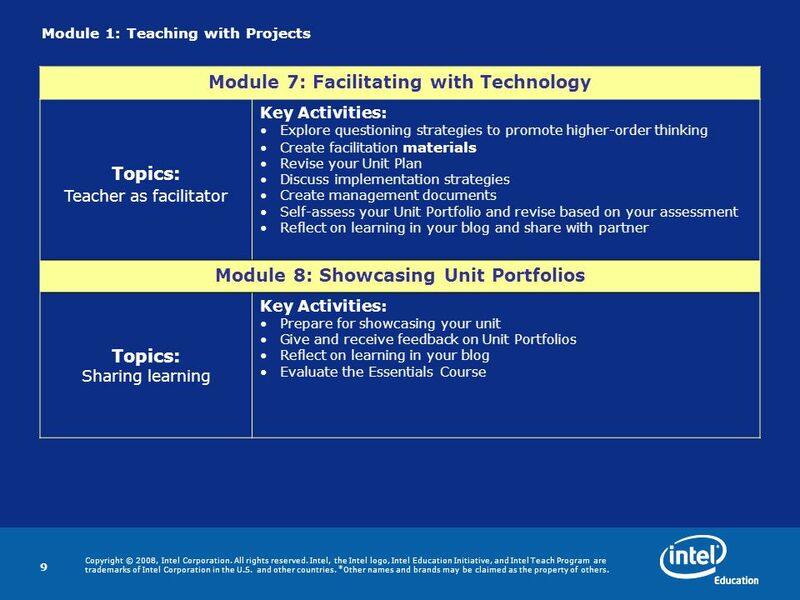 Your Unit Portfolio is developed throughout the course's eight modules. 12 Copyright © 2008, Intel Corporation. All rights reserved. Intel, the Intel logo, Intel Education Initiative, and Intel Teach Program are trademarks of Intel Corporation in the U.S. and other countries. *Other names and brands may be claimed as the property of others. 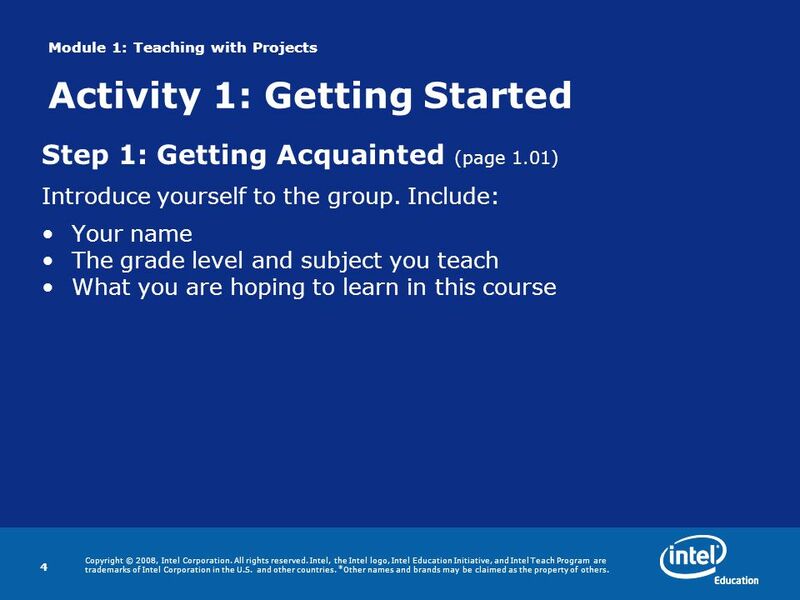 12 Module 1: Teaching with Projects Activity 1: Getting Started Step 4: Creating a Portfolio Folder (cont.) 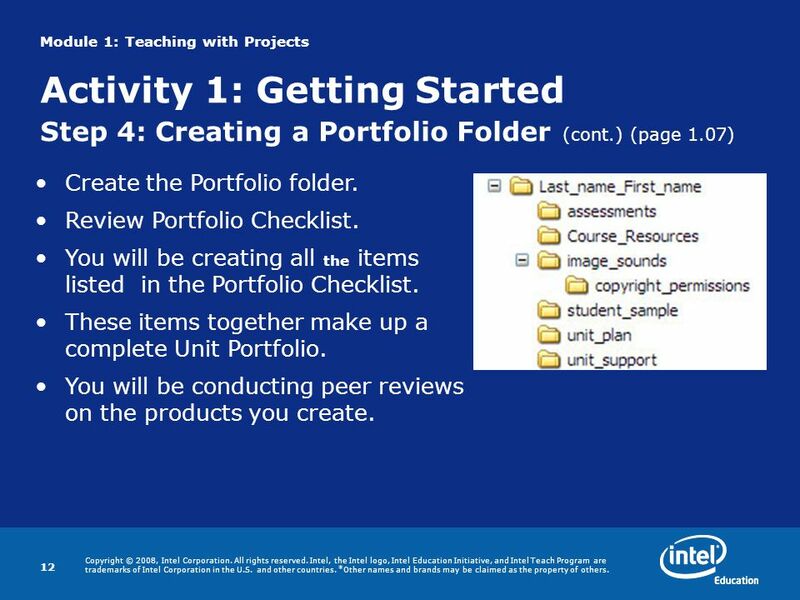 (page 1.07) Create the Portfolio folder. Review Portfolio Checklist. You will be creating all the items listed in the Portfolio Checklist. These items together make up a complete Unit Portfolio. You will be conducting peer reviews on the products you create. 13 Copyright © 2008, Intel Corporation. All rights reserved. Intel, the Intel logo, Intel Education Initiative, and Intel Teach Program are trademarks of Intel Corporation in the U.S. and other countries. *Other names and brands may be claimed as the property of others. 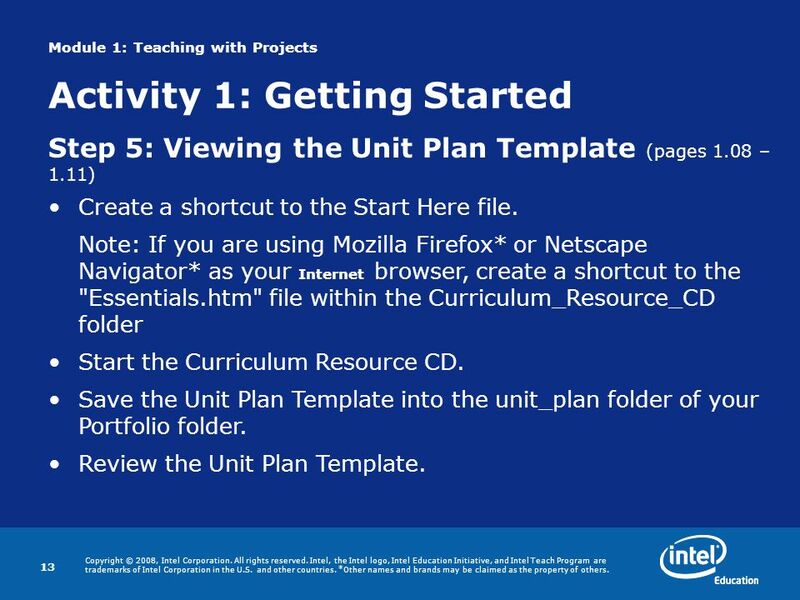 13 Module 1: Teaching with Projects Activity 1: Getting Started Step 5: Viewing the Unit Plan Template (pages 1.08 – 1.11) Create a shortcut to the Start Here file. Note: If you are using Mozilla Firefox* or Netscape Navigator* as your Internet browser, create a shortcut to the "Essentials.htm" file within the Curriculum_Resource_CD folder Start the Curriculum Resource CD. Save the Unit Plan Template into the unit_plan folder of your Portfolio folder. 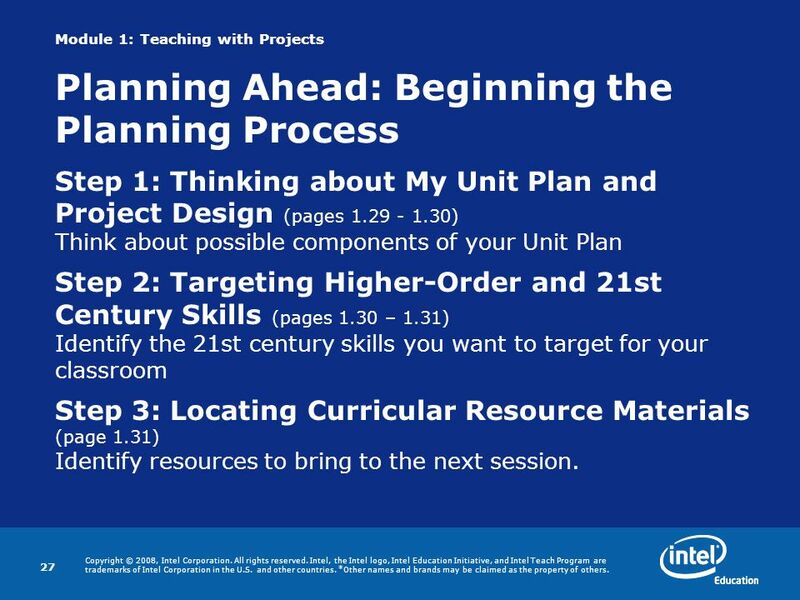 Review the Unit Plan Template. 16 Copyright © 2008, Intel Corporation. All rights reserved. Intel, the Intel logo, Intel Education Initiative, and Intel Teach Program are trademarks of Intel Corporation in the U.S. and other countries. *Other names and brands may be claimed as the property of others. 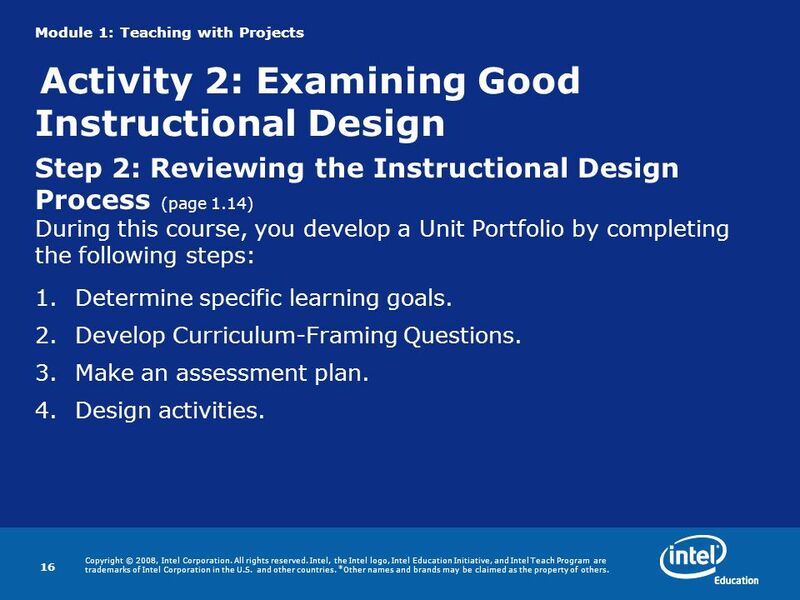 16 Module 1: Teaching with Projects Activity 2: Examining Good Instructional Design Step 2: Reviewing the Instructional Design Process (page 1.14) During this course, you develop a Unit Portfolio by completing the following steps: 1.Determine specific learning goals. 2.Develop Curriculum-Framing Questions. 3.Make an assessment plan. 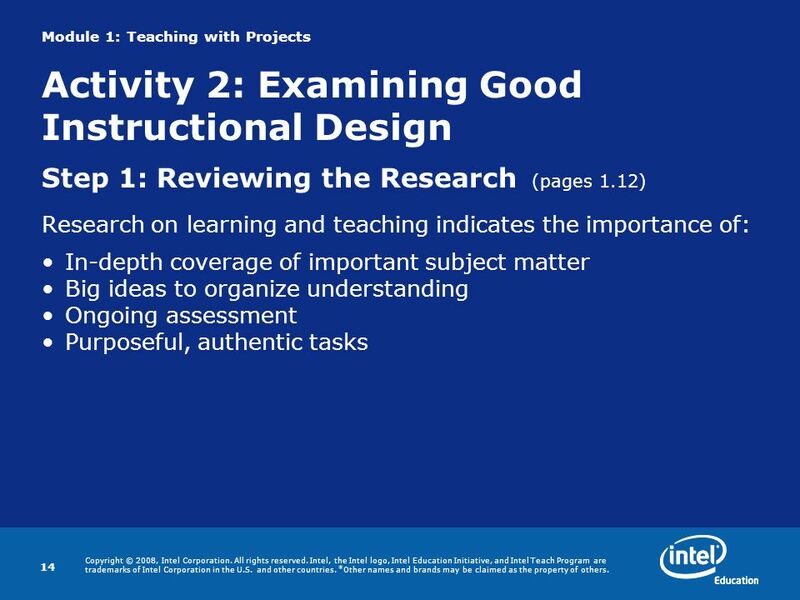 4.Design activities. 18 Copyright © 2008, Intel Corporation. All rights reserved. Intel, the Intel logo, Intel Education Initiative, and Intel Teach Program are trademarks of Intel Corporation in the U.S. and other countries. *Other names and brands may be claimed as the property of others. 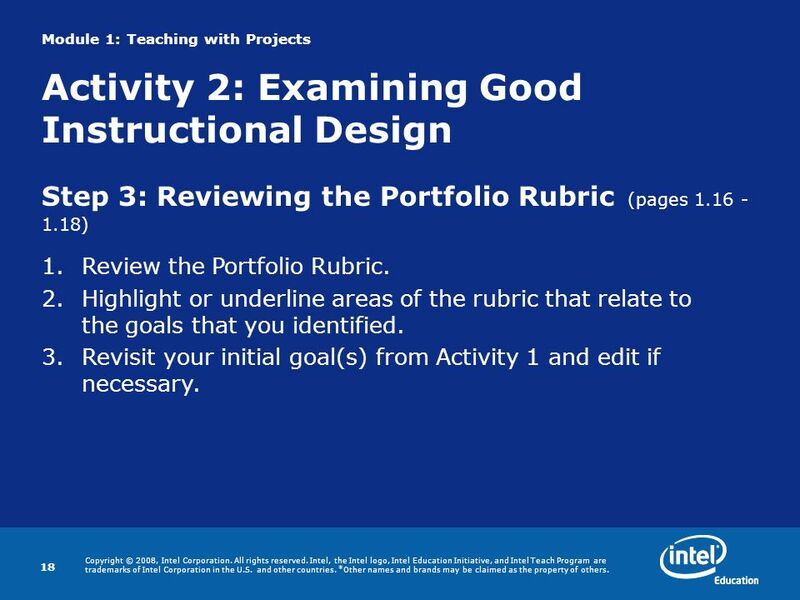 18 Module 1: Teaching with Projects Activity 2: Examining Good Instructional Design Step 3: Reviewing the Portfolio Rubric (pages 1.16 - 1.18) 1.Review the Portfolio Rubric. 2.Highlight or underline areas of the rubric that relate to the goals that you identified. 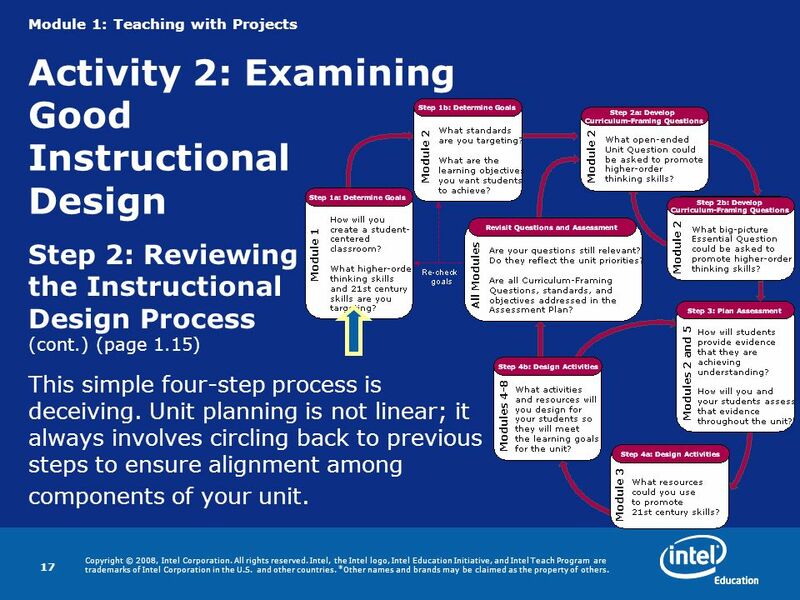 3.Revisit your initial goal(s) from Activity 1 and edit if necessary. 20 Copyright © 2008, Intel Corporation. All rights reserved. Intel, the Intel logo, Intel Education Initiative, and Intel Teach Program are trademarks of Intel Corporation in the U.S. and other countries. *Other names and brands may be claimed as the property of others. 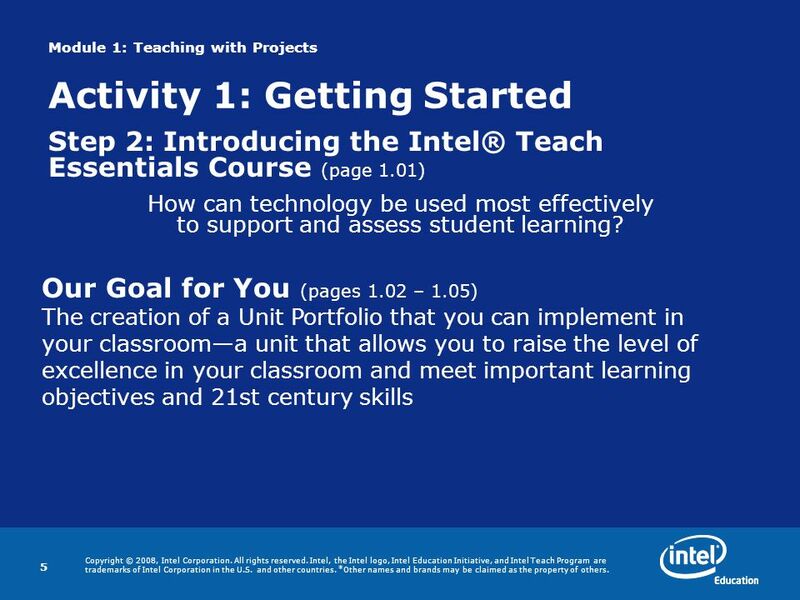 20 Module 1: Teaching with Projects Activity 3: Looking at Projects Step 2: Viewing Unit Portfolios (pages 1.20 – 1.21) 1.View Unit Portfolios on the Curriculum Resource CD or Web. 2.Consider where and how the Unit Portfolios address the various elements of the Project Characteristics Checklist. 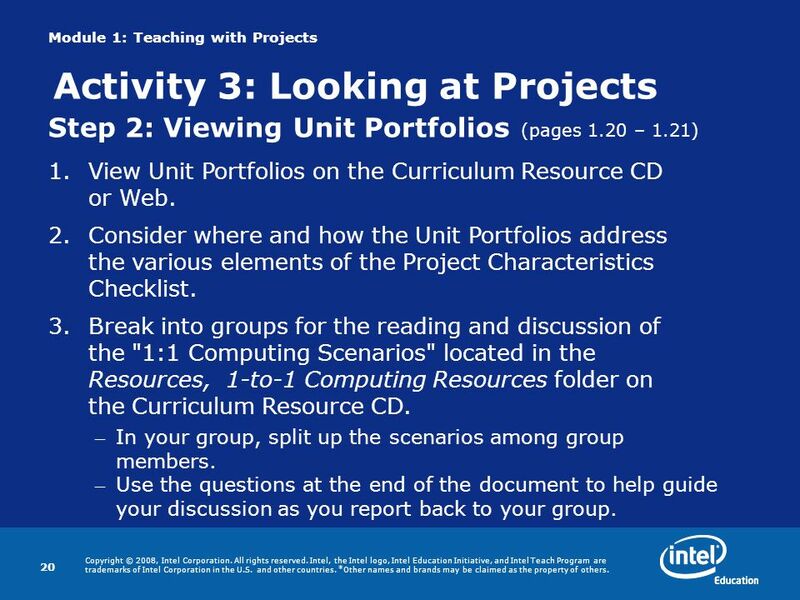 3.Break into groups for the reading and discussion of the "1:1 Computing Scenarios" located in the Resources, 1-to-1 Computing Resources folder on the Curriculum Resource CD. – In your group, split up the scenarios among group members. – Use the questions at the end of the document to help guide your discussion as you report back to your group. 21 Copyright © 2008, Intel Corporation. All rights reserved. Intel, the Intel logo, Intel Education Initiative, and Intel Teach Program are trademarks of Intel Corporation in the U.S. and other countries. *Other names and brands may be claimed as the property of others. 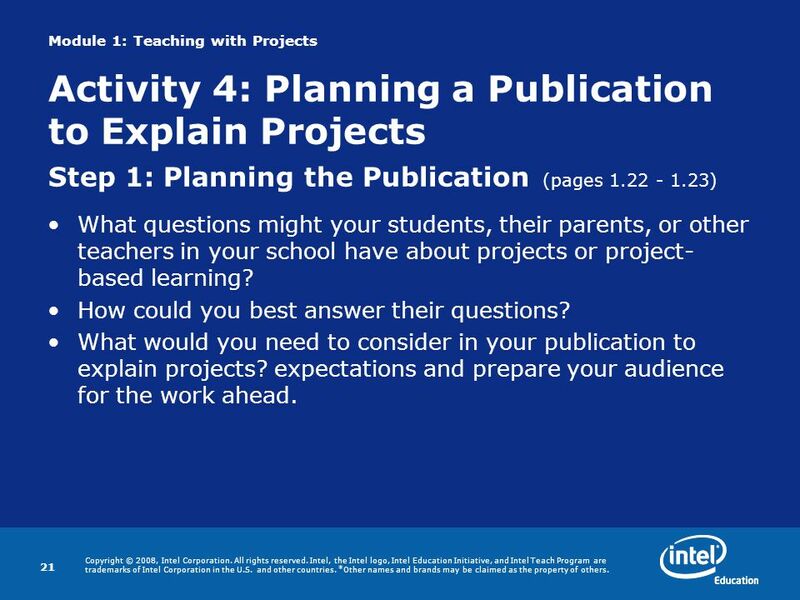 21 Module 1: Teaching with Projects Activity 4: Planning a Publication to Explain Projects Step 1: Planning the Publication (pages 1.22 - 1.23) What questions might your students, their parents, or other teachers in your school have about projects or project- based learning? How could you best answer their questions? What would you need to consider in your publication to explain projects? expectations and prepare your audience for the work ahead. 22 Copyright © 2008, Intel Corporation. All rights reserved. Intel, the Intel logo, Intel Education Initiative, and Intel Teach Program are trademarks of Intel Corporation in the U.S. and other countries. *Other names and brands may be claimed as the property of others. 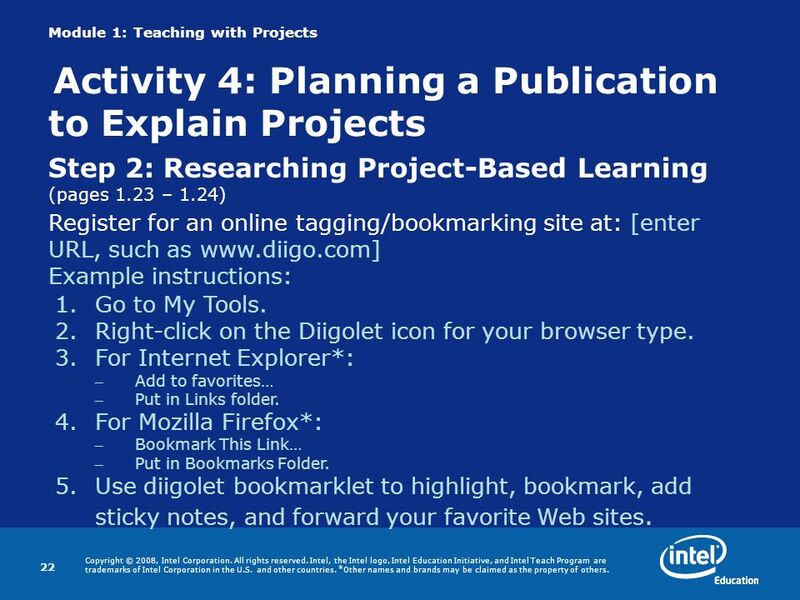 22 Module 1: Teaching with Projects Activity 4: Planning a Publication to Explain Projects Step 2: Researching Project-Based Learning (pages 1.23 – 1.24) Register for an online tagging/bookmarking site at: [enter URL, such as www.diigo.com] Example instructions: 1.Go to My Tools. 2.Right-click on the Diigolet icon for your browser type. 3.For Internet Explorer*: – Add to favorites… – Put in Links folder. 4.For Mozilla Firefox*: – Bookmark This Link… – Put in Bookmarks Folder. 5.Use diigolet bookmarklet to highlight, bookmark, add sticky notes, and forward your favorite Web sites. 23 Copyright © 2008, Intel Corporation. All rights reserved. Intel, the Intel logo, Intel Education Initiative, and Intel Teach Program are trademarks of Intel Corporation in the U.S. and other countries. *Other names and brands may be claimed as the property of others. 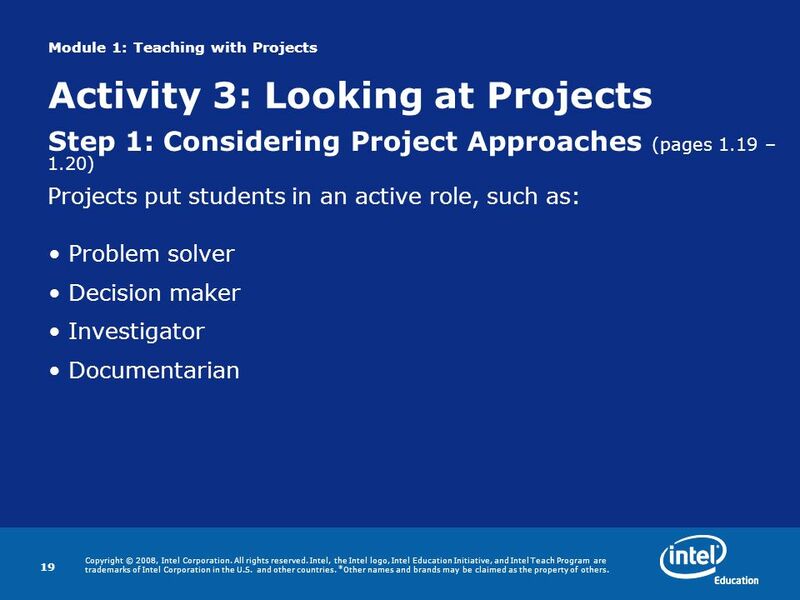 23 Module 1: Teaching with Projects Activity 4: Planning a Publication to Explain Projects Step 2: Researching Project-Based Learning (cont.) 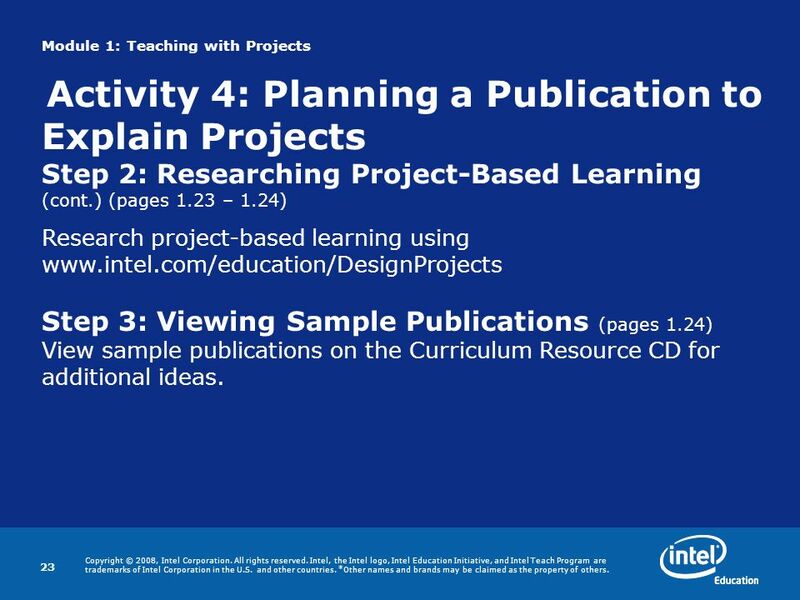 (pages 1.23 – 1.24) Research project-based learning using www.intel.com/education/DesignProjects Step 3: Viewing Sample Publications (pages 1.24) View sample publications on the Curriculum Resource CD for additional ideas. 24 Copyright © 2008, Intel Corporation. All rights reserved. Intel, the Intel logo, Intel Education Initiative, and Intel Teach Program are trademarks of Intel Corporation in the U.S. and other countries. *Other names and brands may be claimed as the property of others. 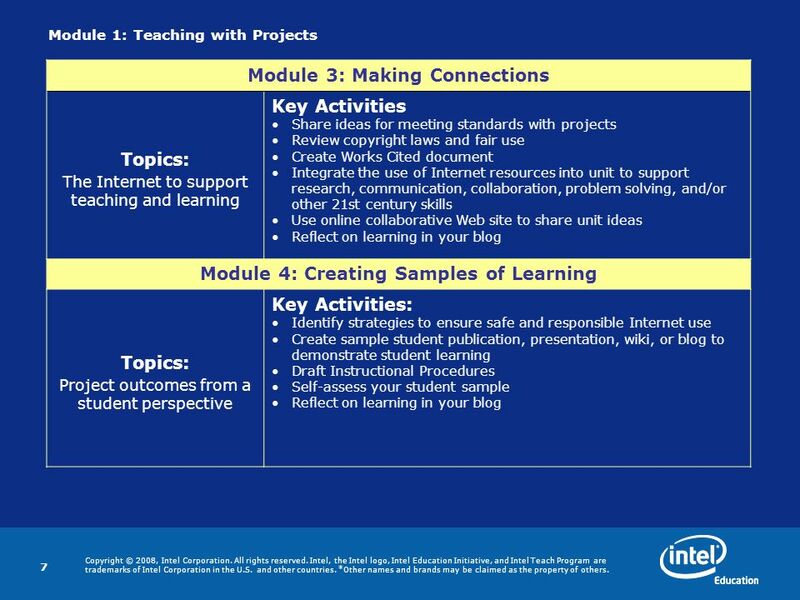 24 Module 1: Teaching with Projects Activity 5: Creating My Publication Step 1: Starting My Publication (pages 1.25 – 1.26) 1.Open a template from the Curriculum Resource CD or Web (optional). 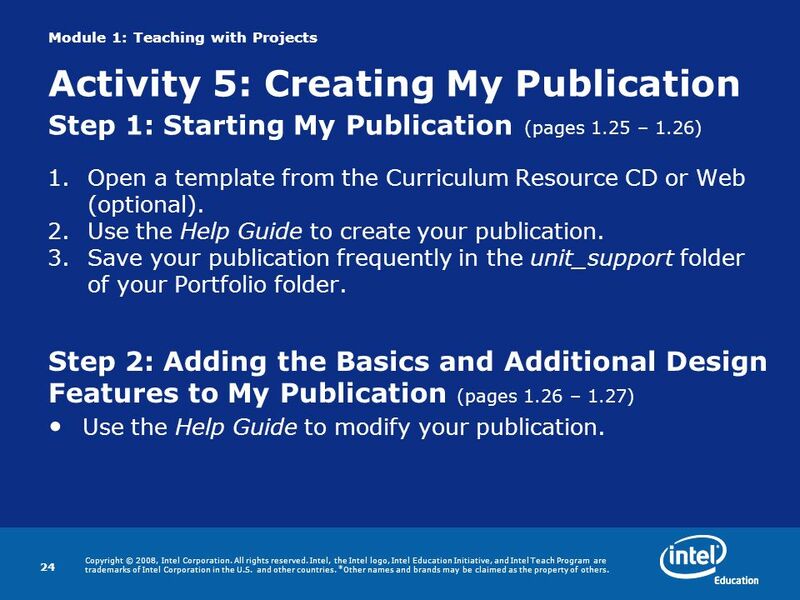 2.Use the Help Guide to create your publication. 3.Save your publication frequently in the unit_support folder of your Portfolio folder. Step 2: Adding the Basics and Additional Design Features to My Publication (pages 1.26 – 1.27) Use the Help Guide to modify your publication. 26 Copyright © 2008, Intel Corporation. All rights reserved. Intel, the Intel logo, Intel Education Initiative, and Intel Teach Program are trademarks of Intel Corporation in the U.S. and other countries. *Other names and brands may be claimed as the property of others. 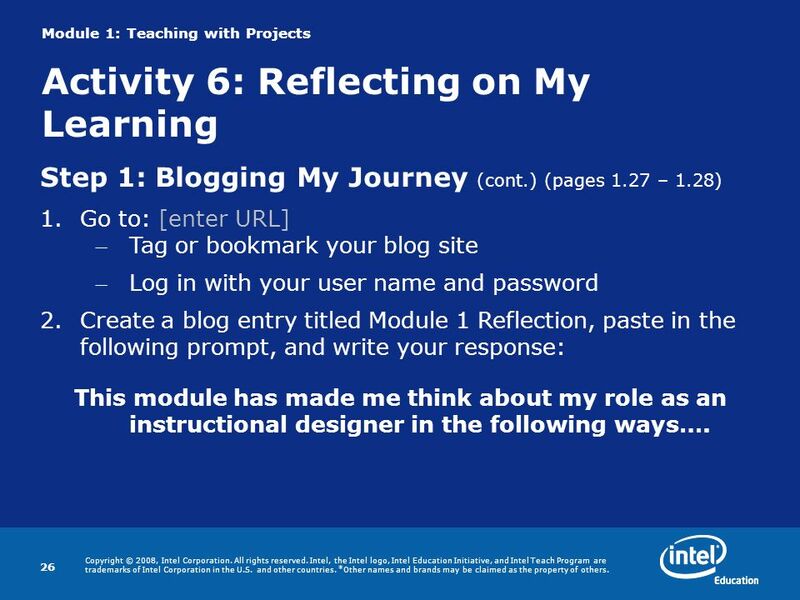 26 Module 1: Teaching with Projects Activity 6: Reflecting on My Learning Step 1: Blogging My Journey (cont.) (pages 1.27 – 1.28) 1.Go to: [enter URL] – Tag or bookmark your blog site – Log in with your user name and password 2.Create a blog entry titled Module 1 Reflection, paste in the following prompt, and write your response: This module has made me think about my role as an instructional designer in the following ways…. 27 Copyright © 2008, Intel Corporation. All rights reserved. Intel, the Intel logo, Intel Education Initiative, and Intel Teach Program are trademarks of Intel Corporation in the U.S. and other countries. *Other names and brands may be claimed as the property of others. 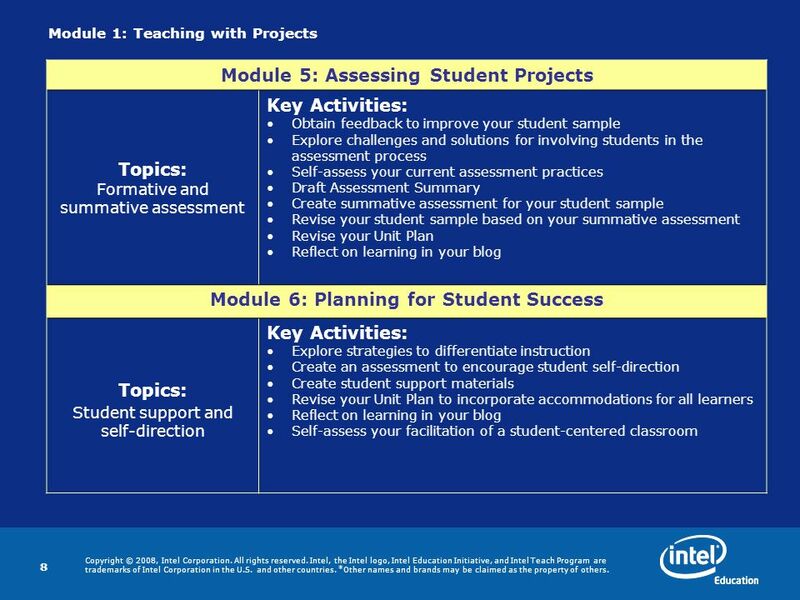 27 Module 1: Teaching with Projects Planning Ahead: Beginning the Planning Process Step 1: Thinking about My Unit Plan and Project Design (pages 1.29 - 1.30) Think about possible components of your Unit Plan Step 2: Targeting Higher-Order and 21st Century Skills (pages 1.30 – 1.31) Identify the 21st century skills you want to target for your classroom Step 3: Locating Curricular Resource Materials (page 1.31) Identify resources to bring to the next session. 28 Copyright © 2008, Intel Corporation. All rights reserved. Intel, the Intel logo, Intel Education Initiative, and Intel Teach Program are trademarks of Intel Corporation in the U.S. and other countries. *Other names and brands may be claimed as the property of others. 28 Looking Ahead Module 2: Planning My Unit Topics: Curriculum-Framing Questions and ongoing student-centered assessment Key Activities: Identify standards for your unit Create learning objectives Create Curriculum-Framing Questions Research effective assessment strategies Draft Assessment Timeline for unit Create presentation to gauge student needs Reflect on learning in your blog Essential Question How can technology be used most effectively to support and assess student learning? 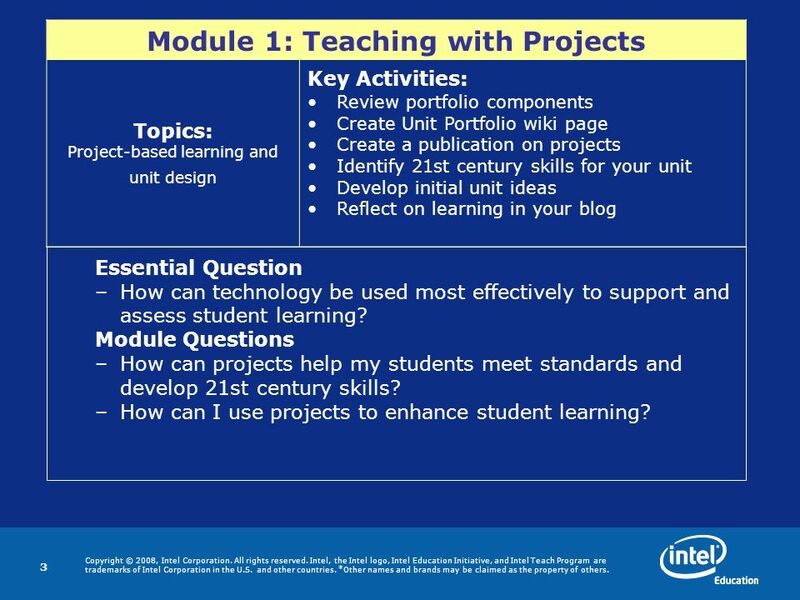 Module Questions How can projects help my students meet standards and develop 21st century skills? 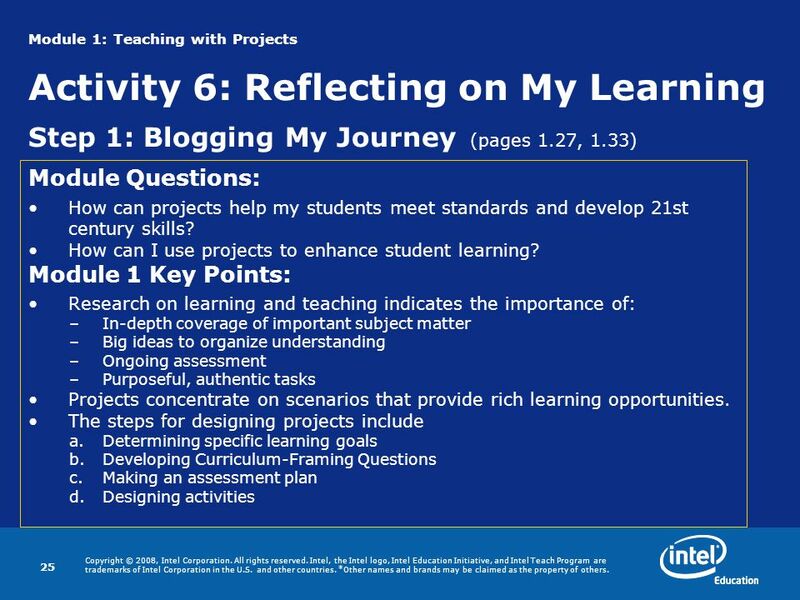 How can I use projects to enhance student learning? 29 Copyright © 2008 Intel Corporation. All rights reserved. Intel, the Intel logo Intel Education Initiative, and the Intel Teach Program are trademarks of Intel Corporation in the U.S. and other countries. *Other names and brands may be claimed as the property of others. 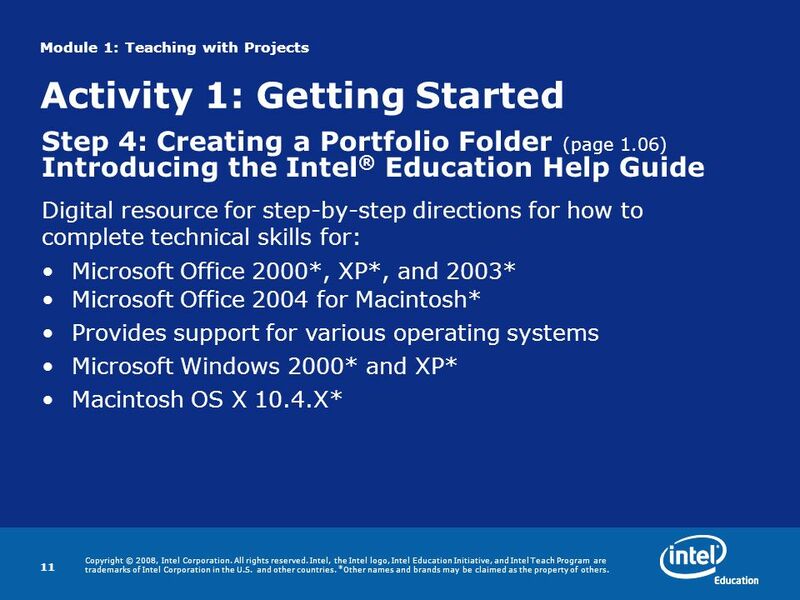 Download ppt "Copyright © 2008, Intel Corporation. All rights reserved. Intel, the Intel logo, Intel Education Initiative, and Intel Teach Program are trademarks of." 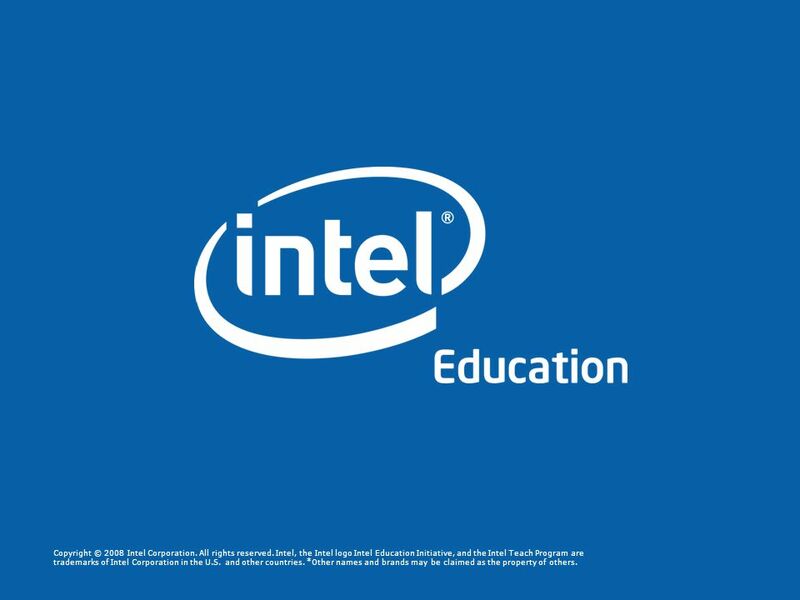 Programs of the Intel® Education Initiative are funded by the Intel Foundation and Intel Corporation. Copyright © 2007 Intel Corporation. All rights reserved. Copyright © 2008 Intel Corporation. All rights reserved. 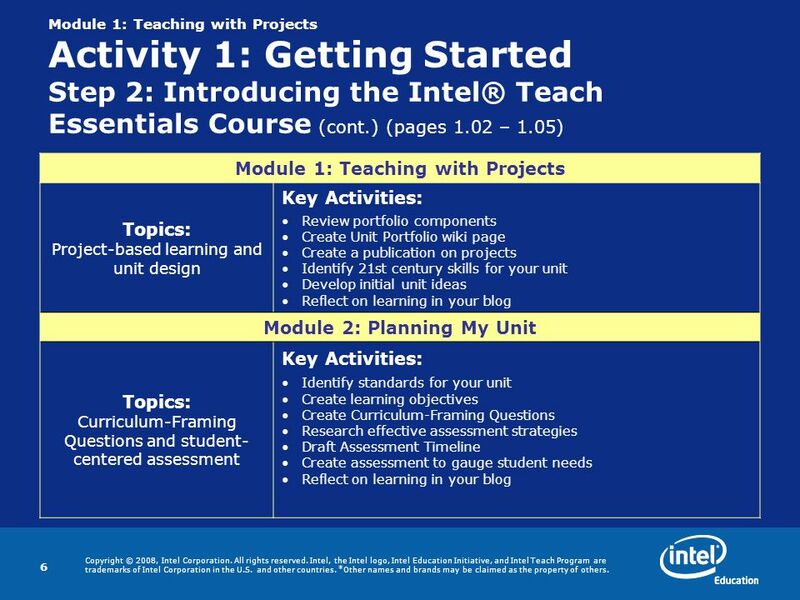 Intel, the Intel logo, Intel Education Initiative, and the Intel Teach Program are trademarks. 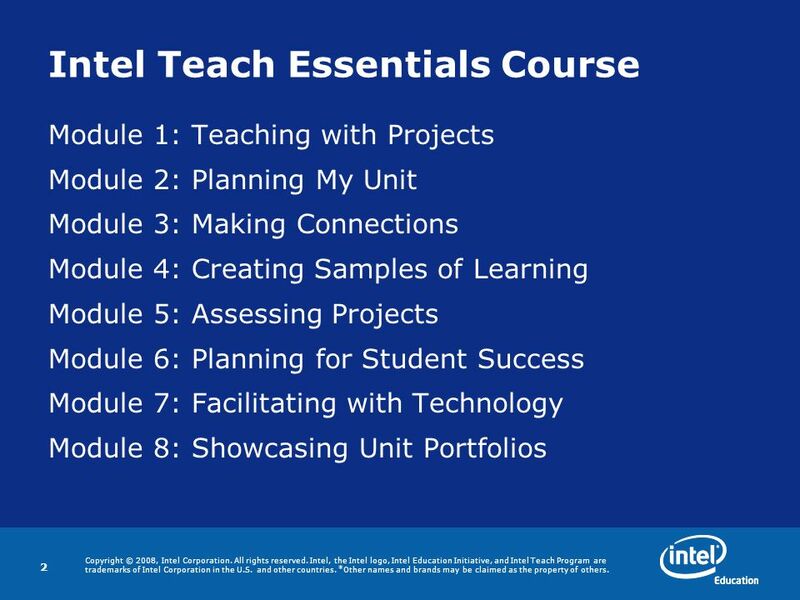 Intel® Teach Program Essentials Course Day 4. Session 2: Introduction to the Quality Criteria. Session Overview Your facilitator, ___________________. [Add details of facilitators background, including. CLAS for TAFE Overview Information session for Riverina Institute TAFE staff wishing to use the tool James Worner, Senior Learning Design Officer Last. Pasewark & Pasewark Microsoft Office XP: Introductory Course 1 INTRODUCTORY MICROSOFT WORD Lesson 8 – Increasing Efficiency Using Word. 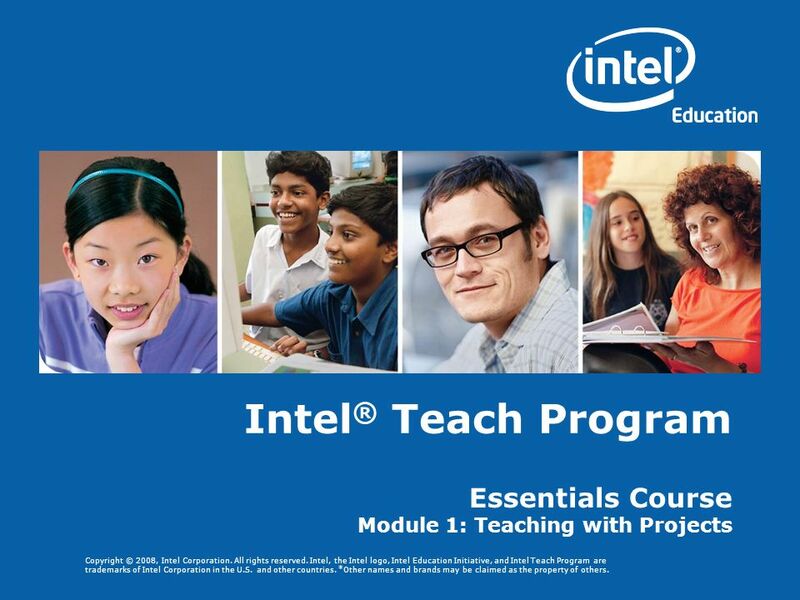 Intel ® Teach Program Programs of the Intel ® Education Initiative are funded by the Intel Foundation and Intel Corporation. Copyright © 2007 Intel Corporation.